Louisville, KY (October 4, 2012) – If asked to identify the most dangerous animal in the United States, most people, depending on where they live, would likely point first to a bear, mountain lion, alligator or even a shark. While those all seem like logical choices, statistics from the Insurance Information Institute reveal that the deadliest animal roaming the countryside is actually the white-tailed deer. According to the Insurance Information Institute’s estimates, each year across the nation white-tailed deer are responsible for tens of thousands of injuries and the deaths of approximately 150 Americans simply by causing car accidents. Those collisions also carry the hefty price tag of $4.6 billion annually in insurance claims. Nationally, Kentucky is considered a “medium risk” state for the likelihood of drivers colliding with deer, ranking 22nd overall last year in collision frequency. Data from the Kentucky State Police (KSP), however, shows that these collisions have defined seasonal peaks. 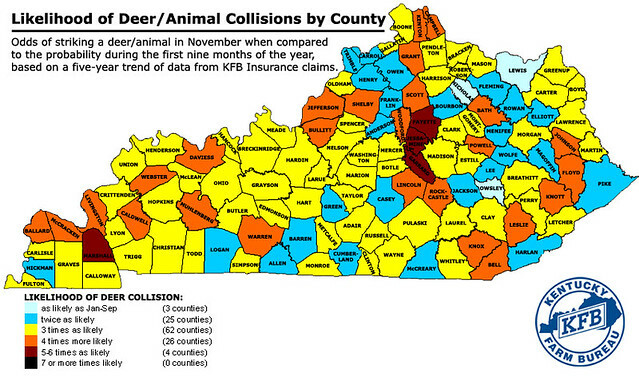 More than 47% of all collisions with deer in Kentucky take place during the months of October, November and December. Analysis by the Highway Loss Data Institute reveals that an average of 14.1 animal collisions per 1,000 drivers occurs nationally each November. Kentucky Farm Bureau (KFB) Insurance claims data shows that drivers statewide nearly doubled the national average in November of 2011, hitting deer on roadways at a clip of 28.05 per 1,000 drivers. As a result of those collisions, KFB Insurance customers filed more than $4.2 million in claims during November alone. For the entire year of 2011, KSP data reports Kentuckians were in a total of 2,976 automobile collisions with deer, resulting in 146 injuries and three deaths. Approximately $19.6 million in KFB Insurance deer collision claims were filed in 2011, but nearly 45% of those claims resulted from accidents occurring in the three-month peak season of October, November and December. Why are deer seen and struck on the roadways more often during this time of year? These three months are also the peak season when deer are breeding, and the animals are less inclined to shy away from busy highways and speeding automobiles if other deer are nearby. 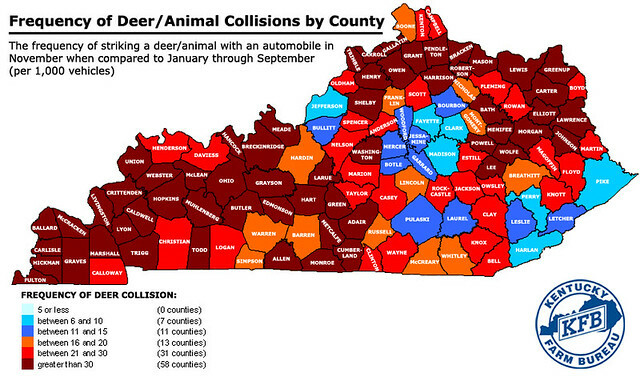 As October is now here, Kentucky’s drivers are entering the peak three-month season for deer collisions. Motorists need to be aware of this hazard and recognize that they are twice as likely as usual to hit a deer on the road in the months of October and December. In November that probability climbs higher still as drivers in most Kentucky counties are three times as likely to collide with a deer on the road. Furthermore, there are 30 counties where drivers become four to seven times as likely to hit a deer during November’s peak season. With the anticipated jump in activity from deer found on the roadways, motorists should drive slower and be aware of their surroundings even more than usual. Deer are most likely to be seen at dusk and dawn near tree-lined roadways or areas that transitions from open fields to forest or water, but drivers must remember that deer are wild animals and often exhibit unpredictable behaviors when on or near road. KFB advises motorists to drive defensively on the roadways this fall, especially when headed into wooded areas where deer are prevalent. Watch for deer crossing signs. These signs are posted to warn drivers that certain stretches of the road are commonly populated with deer. Do not ignore the warning. Be aware of the time. Deer are most commonly seen along roadways in the early morning and evening hours. Exercise additional caution if traveling during these times of day. When driving after dark, use high-beam headlights to increase the range of vision. If a deer is spotted on or near the road, slow down immediately. Don’t swerve if a deer is in the road. Brake firmly but keep the vehicle headed in a straight line. A swerving vehicle can confuse the animal and prevent it from picking a direction to flee, and, worse yet, the driver could lose control and hit a tree or another car. Always wear a seatbelt. The Kentucky State Police says that most people injured or killed in automobile collisions with deer are not wearing seat belts. Peak season for deer activity impacts more than just motorists on the roadways. Click here to read how Kentucky’s growing deer population also affects agriculture. Also be sure to listen to Across Kentucky's Mike Feldhaus talk to Dan Smaldone, Director of Public Relations at Kentucky Farm Bureau, as he explains how to stay safe during this season.